The artist has created a scene file. The scene file with all textures and source files is saved on the fileserver. The artist starts the rrSubmitter via a plugin in the menu in the 3D/comp application. The plugin will read all required information from the scene and sends it to the rrServer. 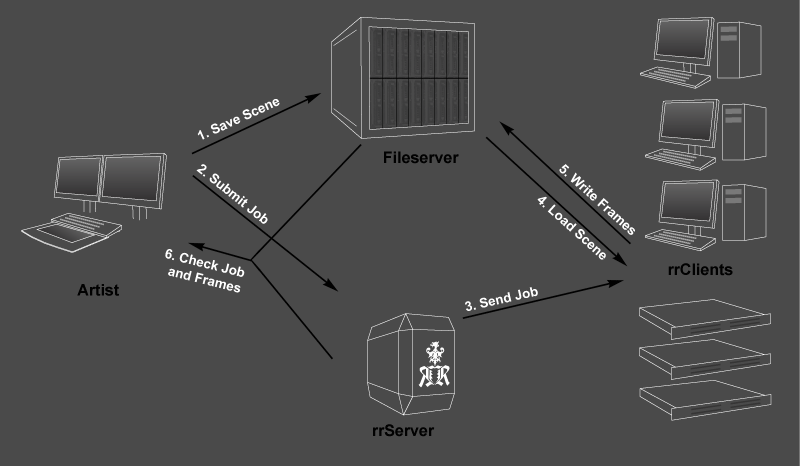 The rrServer sends frames of each job to rrClients. The rrClients are either workstations or pure render farm machines. The rrClient starts the 3D/comp application and loads the scene file from the fileserver. The rrClient renders the frame numbers it has got from the rrServer. Then it checks the frames and writes them to the fileserver. The artist checks the progress of the job via RR. In the end, the artist checks all rendered frames either via the fast rrViewer in small resolution or loads them directly from the fileserver in full resolution.